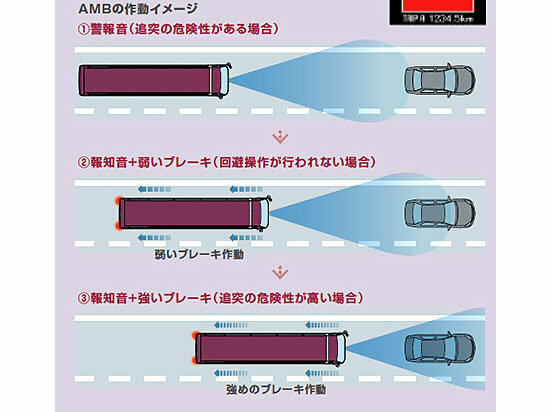 Mitsubishi Fuso Truck and Bus Corporation will launch its 2013 model Aero Queen and Aero Ace large tourist bus incorporating the company’s latest safety technology Active Mitigation Brake system for Japan. The Active Mitigation Brake (AMB) is an active safety technology which decelerates the vehicle by applying the brake automatically when a collision is possible. Using a millimeter wave radar system, the AMB system monitors the distance from the vehicle in front. At first, it sounds an audible alarm to alert the driver of possible danger of collision. If the driver does not take appropriate action, it again sounds an alarm and also gently applies the brakes. When the system determines the driver is still not reacting strongly enough and a collision is imminent, it gives another warning sound and firmly applies the brakes to reduce impact speed in order to mitigate collision damage. The 2013 model Aero Queen and Aero Ace large tourist buses will also incorporate latest advanced safety technologies, including Anti-Spin Regulator (ASR), and Distance Warning as standard on top of the already equipped MDAS-III driver attention monitoring system and Brake Override System (BOS). 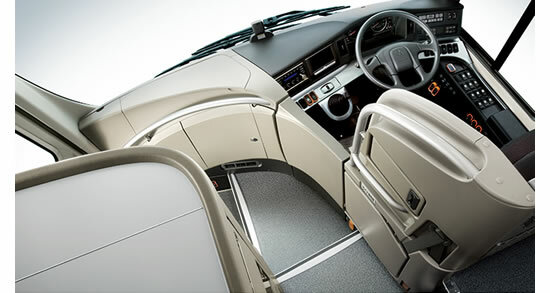 The enhanced, clean and efficient bus will be available at Mitsubishi Fuso dealerships and regional sales centers across Japan from January 15, 2013.